Jones & Keller is one of Colorado's oldest and most respected law firms. Jones & Keller was formed in January 1991 by the merger of two esteemed Denver firms, Jones, Meiklejohn, Kehl & Lyons, and Keller, Wing & Godbolt, and today is a strong, growing full service law firm comprised of talented lawyers focused on client satisfaction. Jones & Keller is named after Marion Jones and Alec Keller, who founded our respective firms over 70 years ago. Their legacy is the high standard that drives the firm today. Our mission is to provide the firm's broad range of clients with consistent service of the highest quality and responsiveness, for reasonable fees. We value the relationship of respect, mutual trust and confidence that we have earned with our clients and those within our profession. We work hard to safeguard the reputation and to promote the values of Jones & Keller. We strive to maintain civility in our work place and in our dealings with others, while advocating our client's interests with ethical and vigorous compassion. Our success in achieving these goals can be measured by our most valuable asset - our human resources. Our culture has attracted preeminent attorneys in all of our major fields of practice and an extremely competent professional staff, most of whom have served the Jones & Keller mission for many, many years. 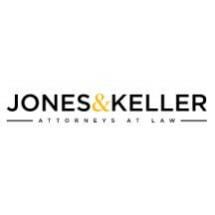 Jones & Keller represents individuals and public and privately held businesses from small start-ups to Fortune 500 companies, providing a wide array of business and personal legal services. We strive to maintain a hands-on relationship with our clients, while providing highly specialized practitioners who can meet clients' needs efficiently and cost effectively. The firm includes lawyers experienced in the areas necessary to provide a full range of business, administrative, tax and litigation services. When beneficial to the interests of our clients, our lawyers work in multi-disciplinary teams across areas of expertise to efficiently serve our client's needs. These teams regularly utilize the specialized knowledge and experience housed in multiple practice areas of the firm, working together to provide legal representation and advisory services to our clients on a comprehensive array of transactional, regulatory, and litigation matters. We want those who choose us as their lawyers to feel at home and assured their legal matters will be handled with the utmost attention and skill. We hope this website helps you understand how we approach our work and what we think are our special attributes.